I spent hours on the internet pouring over hundreds (thousands?) of reviews for accommodations that would meet all of my requirements; 1) location, 2) free breakfast, 3) free wifi, 4) inexpensive, 5) all twin beds, 6) triple rooms available, 7) ensuite bathrooms. First I read the negative reviews, then I read the positive reviews, then I started sending inquiries into availability and rates. The plan was to fly out of Orlando to JFK on Delta, connecting on Alitalia to Rome. I had everyone’s confirmation numbers, and had carefully selected the overseas seats based on their preferences. But you know what they say, “We plan, God laughs”. Due to the Air Traffic control problems with the government, our flight was very late getting into JFK, so we missed our Alitalia flight. And since it was the “fault” of ATC, Delta informed us that they were not responsible for us. They rebooked us to fly out the next day. We found the Hilton Garden Inn in Queens (it was nice, by the way). I spent many hours contacting our hotel in Rome, our airport transportation, and making changes to our Vatican and Scavi tours that I had set up months in advance. We arrived in Rome and our driver was not there in the waiting area. I used the pay phone and my onesuite.comaccount to call Rome Shuttle Limo (www.romeshuttlelimousine.com) and they told me the driver was parking and would be there any minute. Thank goodness. The Vatican was extremely crowded. It was Saturday in May, probably the worst time to visit. Angelo had suggested a special tour before the Vatican opens, when there would be no crowds. Although tempting, I knew it would be impossible to gather my group together before coffee and breakfast. As it was, with our flight delay we barely made the tour at 10am. Like….eating granite! My favorite place in Rome is right next to the Pantheon, Tazzo D’Oro. You may think it’s just a coffee shop, and it does have the BEST coffee, but you have to try the caffe granite con panna. It’s like a coffee slushy with whipped cream. I love it even more than gelato and I LOVE gelato! We took taxis to Termini. We bought our tickets (2ndclass) and made our way to the platform. It was very confusing and I was glad we had a former New Yorker with us to lead us to the right train. Suddenly several men all in matching tee shirts eagerly offered to help the women with their bags. Before I could warn them, they were handing over their luggage. The men efficiently took the bags on the train and then aggressively demanded a tip. When they weren’t satisfied with the tip that was offered, they wouldn’t leave. Finally, after everyone strongly said “NO!” they got off the train. Lesson learned. I was so excited to arrive in Orvieto. None of the other women had been there and it is one of my favorite places in Italy. And CasaSelita has to be one of my favorite places to stay. It didn’t disappoint. CasaSelita is an old farm converted to a charming B&B on the outskirts of Orvieto in the middle of the gorgeous Umbrian countryside. Selita and her husband Ennio run the pristine B&B. (You can read my review on tripadvisor here.) For those who can’t decide between staying in town or out in the country at an agriturismo, CasaSelita is a perfect blend of staying in the country with easy access to town. Here is a link to my pictures of CasaSelita. Click here. We left Trattoria del Moro full of good food, Orvieto wine, and tired from our journey from Rome. But we had to see the Orvieto Duomo. As we rounded the corner, it took us by surprise. Breathtaking. The 14thcentury Duomo stands majestically in the middle of this little town. 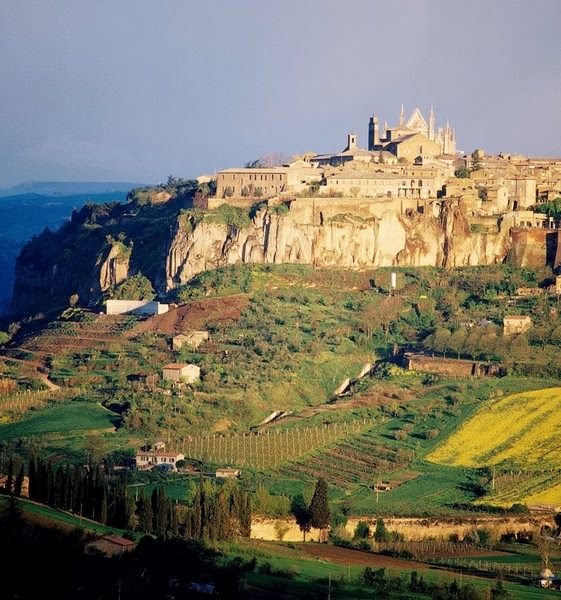 It is hard to describe if you’ve never been there, but the Orvieto Duomo is worth an unscheduled stop in Orvieto, if for that alone. After four days in Orvieto, we were all ready to stay for the summer! But we still had a few days in Florence to experience. At first we were going to take the train straight to Florence, but we decided to splurge on a driver/guide. I hired Luca from Hills and Roads (hills and roads.com) to drive us through Tuscany, with a stop in Sienna and a fabulous lunch at a farmhouse out in the county. Luca picked us up at CasaSelita right at 9:00am. Unfortunately, it was a cold, gray, rainy day. Luca had planned to take us to some of the little villages along the way, but instead we went straight to Sienna. Sienna is Luca’s hometown so he was a perfect person to show us around. His knowledge of the region made it so much more interesting than if we had gone by ourselves. After Sienna we drove to a farm out in the country, where we were treated to a special lunch prepared from food grown on the farm. The dining room, originally the barn for the cattle, had old wood floors and a big window overlooking the countryside. The first course was a large plate of homemade pasta and tomato sauce. We heartily ate every bite. Then, to our surprise, came another course. The food just kept on coming—fresh ham and salami, grilled vegetables, breads, cheeses, and of course, wine. We were stuffed, but couldn’t resist dessert! When I started organizing this trip, years ago it seems, all of the women knew that I am a “carry-on only” kind of gal. (See my article about traveling with just a carry on here. I don’t have many rules, and believe everyone should be able to do what works for them, EXCEPT when it comes to carry ons. I don’t want to wait while someone looks for their huge suitcase on the turnstile. And I sure don’t want the drama that unfolds when the airline loses someone’s luggage. But most of all, if you stay in great little inexpensive B&B’s, you will probably be dragging your own luggage up a few flights of stairs. Luca dropped us off right in front of Hotel Europa, conveniently located just a few blocks down Via Cavour from the Duomo. I picked Hotel Europa because of the good reviews I read on Tripadvisor. I had stayed at Hotel Casci right across the street and I loved area—so close to the Duomo, around the corner from the Accademia, and just a block or so from the San Lorenzo market. I really liked Hotel Casci and the rate is comparable to Hotel Europa, but I wanted to experience a different hotel this time. They are both two star hotels so neither is fancy, and both have a good breakfast and free wifi. Both offer a discount for paying in cash. We splurged on a taxi to take us to Piazzale Michelangelo. We drove over the Arno River, through the residential area. Next time I come to Florence I think I’d like to stay on that side of the river for a totally different experience. The taxi let us off at what looked like a parking lot. I led us over to the ledge where several people had congregated to get a good view. Couples were handing their cameras to strangers to take their pictures with all of Florence in the background. It was sprinkling intermittently, but we didn’t care. It was our last night in Florence, our last night together. Absolutely loved your blog.It was so informative for a first time traveller to Italy. Im visiting in October and Im gonna look up all the hotels & activities you recommended. Can you put up something on Naples & Capri also ? Thanks for your comments! I have not been to Naples or Capri, but if you read about my trip to the Amalfi Coast, there are a lot of good recommendations about that area. Keep reading for future trips and travel tips!